On top of this there are bills being proposed in states like Indiana which, should they become law, would give police the power to stop protests “by any means necessary” including “costing lives”. The right wing, emboldened by the Trump presidency, is clearly trying to steer the country into a fascistic state. A Republican Party official in northern Michigan has issued what amounts to a death threat against American college protesters, calling for “another Kent State” in the wake of protests at the University of California, Berkeley. 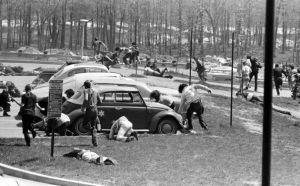 In 1970, members of the Ohio National Guard fired on unarmed Kent State University students protesting the U.S. incursion into Cambodia. Guardsmen killed four students and wounded nine, including one who was paralyzed for life. Great article, Mr. Gee. America really has fallen into a time portal. Following 4 1/2 years in the Army–including Infantry OCS, and two tours in Vietnam–I was a student at Ohio State when, following the Kent massacre, parts of the same Ohio National Guard Division were in Columbus. Of the six or seven Guardsman that I spoke with, not a one had been to boot camp or even fired their weapon on a rifle range. Could the troops in Kent have been similarly unprepared? Whatever officer was commanding a detachment of, perhaps, 80 men, double-time right up to the front of the Administration Building. Going around to the rear service entrance would have been a much more logical deployment. They did something that seasoned troops would have never been asked to do–run in formation, with unsheathed bayonets “fixed” (at the end of the muzzle). Besides being dangerous to them, WHY BE CONFRONTATIONAL? Some years later, I read a synopsis of the court proceedings, and it seems that the same stupidity was used in deploying those troop, as well. During the Ferguson Riots, a couple of years ago, I wrote how truly unprepared any Army, even seasoned troops, is for civil defense. Un like an enemy in combat, the civilians aren’t all wearing term same uniforms. They are milling around, going in different directions. Even Law Enforcement has trouble in civil unrest situations. Lastly, I sure don’t remember any riot control exercises at The Infantry School. Thank you for sharing your recollections, knowledge and experience with us Cheekos. The present day is vastly more combustible than the Days of Rage. The not-too-subtle threats of violent repression is worse than anything that took place during the anti-war movement, mainly because there is no triggering event today, except the desire of the reactionaries to inflict bloody repression. They are setting the stage for something we have never seen: a designed program of armed repression against immigrants, minorities, protestors and others who have the audacity to subscribe to this right wing regime in the offing. It is as though the regime of the buffoon has allowed their reactionary fantasies to flower. This cannot end well. Politics is no longer enough to satisfy these authoritarians. They was to “take America back” to some imagined time when what they said was accepted by everyone, and the poor and minorities and immigrants did not question their authority. Given that “they” (the white reactionary authoritarian mob) are soon not even going to be a majority, they are desperate. I really am not being alarmist when I say: The fuse is lit and there will soon be an explosion, Politics as usual will not contain it. And unfortunately this time the skin heads and nationalists and those armed by the states and the feds will be on the same side–against us. Thank you for sharing your experiences and recollections of those days. What you have written here is very frightening, but as you say the right wing authoritarians are becoming sickeningly desperate to hold on to power, and it seems they have even more weapons at their disposal these days to accomplish their reactionary agendas.